Simon Leach graduated from the Royal Northern College of Music in 1992 with the Alice Shawcross Organ Award. At the RNCM he studied organ with Gordon Stewart, harpsichord with David Francis and piano with David Lloyd. He regularly performed with RNCM Symphony and Chamber Orchestras. He appeared in master classes with Daniel Roth, Olivier Latry, Susan Landale and Jacques Van Ootmerssen. A RNCM travel bursary enabled Simon to travel to Paris to receive some coaching on the interpretation of the compositions of Naji Hakim with the composer. On his return to England he won 1st prize in the Prix Scabo keyboard competition with a performance of Hakim’s Embrace of Fire and was subsequently invited to perform the composers Hommage Á Igor Stravinski in the prestigious Principal’s concert. 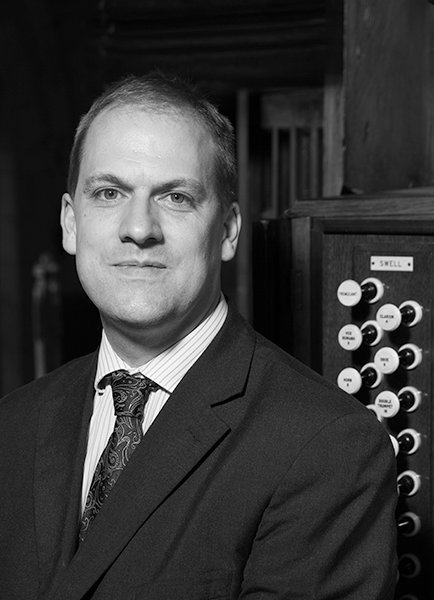 After graduating Simon was appointed organ scholar at the Liverpool Metropolitan Cathedral of Christ the King where he accompanied the choir for services, concerts and on several European tours. Since leaving the Cathedral Simon has combined his work as a freelance performer with a busy private and school teaching schedule. He is on the instrumental teaching staff at The Manchester Grammar School and Withington Girls’ School and very much involved in the musical life of both schools. He recently accompanied the Withington Girls’ School choir in the first performance of a specially commissioned Choral Suite by Sasha Johnson Mannings at the Bridgewater Hall, Manchester to celebrate the 125 anniversary of the formation of the school. He regularly plays for the schools Founders Days, Concerts and accompanies the students for the practical examinations. He has given solo organ recitals in many of Great Britain’s Cathedrals and Concert Halls including Westminster, Newcastle, Coventry, Manchester, Chester Cathedrals and the Reid Concert Hall, Edinburgh. He first performed in the USA in 2010 at the Cathedral of St Patrick New York and has returned to America on subsequent occasions performing again at St Patrick’s and at the Church of St Thomas 5th Avenue. In February 2017, Simon gave his hugely successful debut recital at Notre Dame Cathedral, Paris. Simon performs regularly for radio broadcasts and is on the team of organists for the BBC Daily Service which is broadcast live on BBC Radio 4. He has also played the organ on several editions of Coronation Street and the Christmas Carols with Corrie.